Suffer from chronic pain? P. Brendon Lundberg's newly released book 'Radiant Relief: A Cae for a Better Solution to Chronic Pain' may have the answer for you. 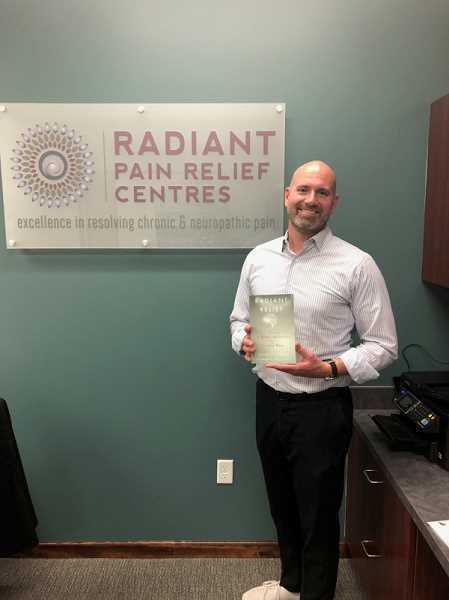 P. Brendon Lundberg, co-founder of Radiant Pain Relief Centres of Portland, has released an Amazon best-selling book called "Radiant Relief: A Case for a Better Solution to Chronic Pain," written in collaboration with Radiant Pain Relief Centres' co-founder, David B. Farley, M.D., also of Portland. Radiant Pain Relief Centres offer a pioneering approach in treating chronic pain. The book paints the picture of their vision to change the way chronic pain is understood and treated, and tells the story of this journey to building a drug-free, non-invasive solution to the $600 billion a year problem of chronic pain that affects 100 million people in the United States (based on the American Academy of Pain Medicine). Books are sold on Amazon. "The science of persistent pain has changed significantly in recent years — we now know chronic pain is a problem of the brain, not the tissue, although most therapies simply address the tissue," said Lundberg. "Our technology allows us to retrain the brain and restore it back to a more normal perception of pain; and we're building clinics around this technology to allow us to create a new approach and understanding of chronic pain management, without the use of addictive pain medications, like opioids." In "Radiant Relief," Lundberg and Farley present a case for a better solution to chronic pain, based upon the latest science and their years of substantial research on this drug-free, lasting approach that demonstrates a safer, more effective treatment by retraining the brain with non-invasive technology and neuroplasticity. The authors combine recent science, innovative thinking and reveal their own personal journeys of discovery and understanding to illustrate the future of pain management — lasting relief without drugs, needles, surgery or side-effects. Radiant Relief Pain Centres offer a free consultation and free treatment session, to allow patients the opportunity to experience the treatment before they make an investment. Treatment is offered on an annual membership basis of $3,500, which includes 20 one-hour treatments. Additional treatments are $35 per procedure. Lundberg is not only the co-founder of Radiant Pain Relief Centres, but is a previous chronic pain sufferer with work experience in healthcare management, marketing, business development, and sales. He played key operational and business development roles for two award-winning companies and was director of sales and marketing for a medical start-up. He lives with his wife and children near Portland. Farley is the chief medical officer of Radiant Pain Relief Centres and has treated clients for 30 years in his family practice. He earned his medical degree from the joint Harvard-MIT Program of Health Sciences and Technology. He and his wife live in West Linn. chronic-pain/, or visit Radiant Pain Relief on Facebook, Instagram or Twitter @RadiantRelief.